M&P can make custom Delrin Machined Parts to your specifications or drawings. We have a plastic CNC machining facility, Delrin® is one of the plastics we can use to make parts. Delrin® is the homopolymer version of Acetal. 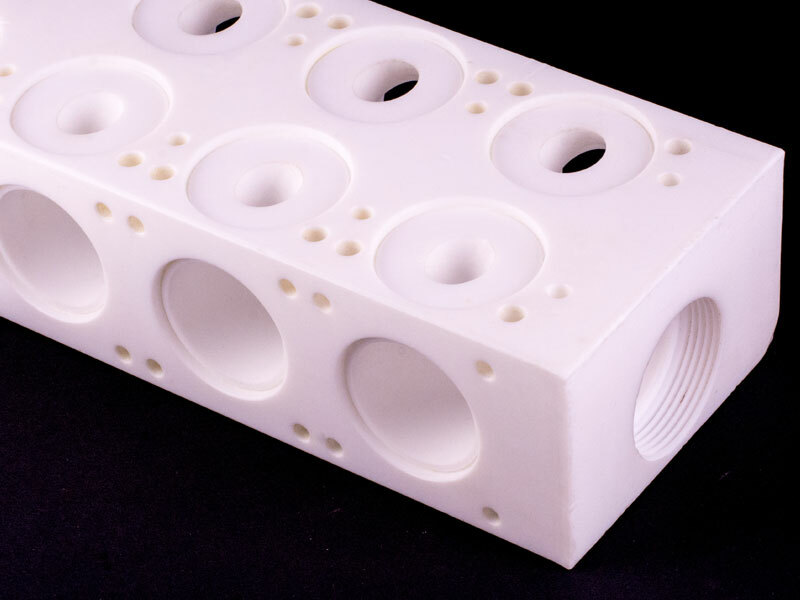 It offers slightly higher mechanical properties than acetal copolymer, but may contain a low density center especially in large cross-sections. It also offers a little less chemical resistance than copolymer acetal. Delrin® is available in BLACK and natural (OFF-WHITE) colors. This material is manufactured from Delrin® homopolymer resin which has been uniformly filled with a dispersion of PTFE fibers. Delrin® AF is a unique thermoplastic material for use in moving parts in which low friction and long wear life are important. It retains 90% of the mechanical strength of unfilled acetal homopolymer, while offering very low friction. Machined Delrin® parts are made in a completely controlled environment. Delrin O-rings, Delrin Seats, Delrin Bushings, Delrin Bearings, Delrin Guide Blocks, Delrin Wear Pads, Delrin Washers. M&P keeps Delrin® in stock so that we are ready for immediate production of your Delrin® Machined Parts. Delrin® is a registered trademark of E. I. du Pont de Nemours and Company.